The last several hikes have felt like an approach to a leveling off spot on a long ridge. You scramble up and over things to reach it. A spot where you're finally just walking along a beautiful ridge with outstanding views and easier terrain. On this hike we reached this ridge, or plateau, on North Tripyramid, and figuratively started down the other side of the mountain as this was Wicket's 24th of the 48 4ks. The hike from there over Middle Tripyramid became her 25th. We of course are very pleased with her, and she of course takes it all in stride. As long as she's wth us she's happy, and of course you know, that is special, and she knows it too, and doesn't need to be hiking mountains for it to be so. So, without questioning, she trotted out Livermore Road with us, not knowing and not caring what we might be about to face, or that this would be numbers 24 & 25. What the hell is a 24 & a 25 anyway? It is such a sweet approach and retreat from these mountains along this road, and Wicket took full advantage, using up most of it, and returning when called at the approach of several mountain bikes, but few other hikers. Hiking like this seems to go by very quickly for me now. Boy, they really fixed my leg-incredible, never thought I'd be hiking these things again as we started up North Slide almost 10 years to the day of my first ascent. Thoughts of my hip-surgery/replacement and recovery went through my mind as I picked and pushed my way up the bottom section of the slide, choosing my course carefully as it was damp and mossy. Judy and I had both hiked up the North Slide before, but never together, but oh yeah, we have been DOWN the North Slide together before, in the RAIN and FOG on our first 4k's EVER. We each picked our own way through the loose gravel and wet, mossy boulders and slabs that make up the base of the slide. Wicket chose to pick her way through trees to the side of the slide which kept her in the shade on the lower part. In this way we made it up to drier, but no less steep terrain, maybe a third of the way up. Choosing a path alternated from loose gravel to boulders now, with fewer slabby sections, and the going was easier. I certainly never thought this would be possible for me to do again a few years ago. The thought of it would have made my hip hurt. Today I had done it pain free, a true medical miracle. So, I guess along with Wicket, it is, in a sense, my first time through the 48. First time pain free in nearly 20 years of hiking, anyway. Knee and hip injuries on my right side early on in my hiking career had plagued me for that long. And so, Judy, Wicket and I reached more than a mountain-top as we reached the summit of North Tripyramid, we reached at the imaginary hump on the journey through the 48, we had reached halfway. We ate and chatted with a teenage girl and her father on North Tripyramid. She had just completed her first round, congratulations to her, and congratulations to dad for encouraging her to hike them all with him! The short scrambles along the way over to Middle Tripyramid, and then on to South Tripyramid seemed like child's play after ascending the North Slide. We stopped briefly at Middle Tripyramid for more food and water. I was contemplating what a USF&G Ranger had said in an article in the Union Leader that basically was asking the question, "What are old people thinking going hiking in the mountains?" "Old people are generally better prepared and more experienced than younger people. Most of our rescue calls are people in their 20's & 30's." I was thinking about these things as we had been leap-frogging with a group of 20 somethings. We had met and passed them ascending the slide, had caught up to them again on Middle Tripyramid, then passed them again descending the South Slide. I am not judging them or questioning their ability to be out there, they seemed to be doing just fine. The one who seemed to be leading was going at a pace that matched the ability of the slowest of the others. I was going over in my mind the differences between our party and theirs, and what would be the factors involved in an emergency for either of us. It just reinforced to me the fact that anyone, no matter what age or ability, can take a mis-step and need a rescue, or have to self-rescue. In either case, preparedness is the key to survival, no matter what. With these and other thoughts running through my head as we descended South Slide I also became thankful that so far, we have been granted safe passage through these White Hills on our current journey once again. We soon managed to safely descend South Slide, reaffirming my conviction that South Slide is infinitely easier in either direction than North Slide, though maybe not as much fun. After the footing on the descent of the slide, the trail that enters the forest from the base of the slide seems like a soft, but firm sidewalk, almost completely void of obstacles like rocks and roots. 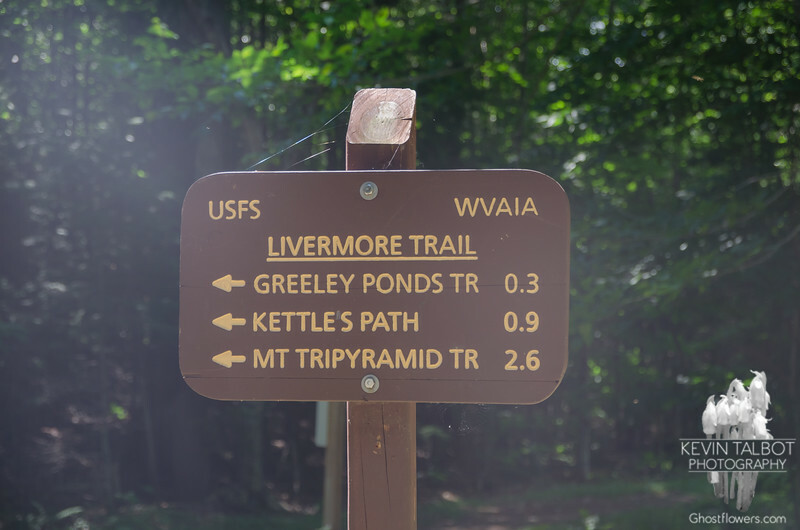 When it finally returns to the Livermore Trail and further along becomes the Livermore Road once again, the hiking becomes more akin to a walk in the park than a grueling 11 mile, 3000' trek over 3 mountains and 2 slides.